The Brush Arbor Gurlz are composed of Native American artists and drag queens representing several tribal nations. The group’s name is based on brush arbors of Southeastern tribes used for social occasions. 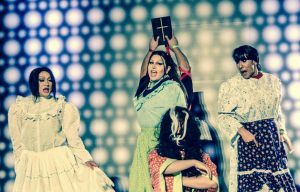 The Brush Arbor Gurlz can be found performing around the US often introducing audience to Native politics for the first time.